Diggers Valley: 4 December 2010. The week beginning the 4th of December 2010. I went back to see if I could find any more of the tiny orchids I found a couple of weeks ago. It took me ages to spot the tiny plants, which have finished flowering and are now fruiting. 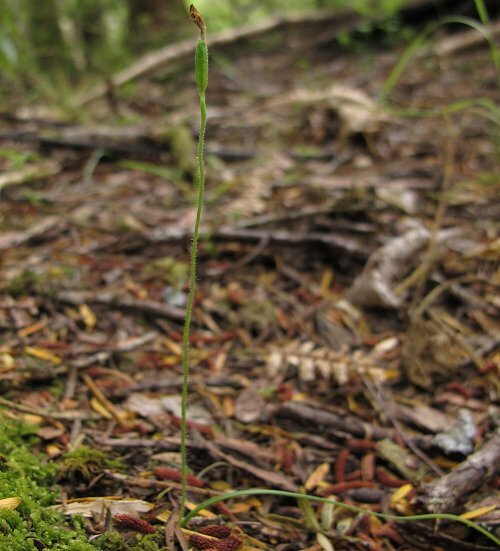 The Flowering Times table from the Native Orchid website indicates that they could be expected to flower for longer, so I had hoped to find some more still blooming. 571, a three-year-old first-calf heifer, has this submandibular swelling - the little lump under her jaw. Generally an indication of a protein imbalance caused by internal parasitism, I've also seen it come and go in some animals in situations where that cause is unlikely. This lump is very minor, so I shall watch and see if it changes, and keep a close eye on 571's general health. 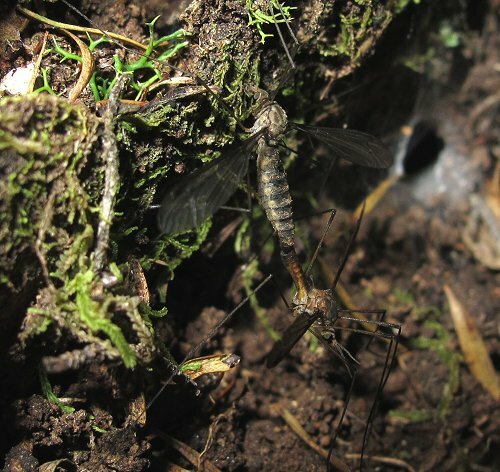 A couple of insects I was finally able to see clearly, after earlier only seeing them in jerky, fast flight around the fallen Puriri trunk where I've been watching some orchids. They seemed like very scary huge mozzies when I first saw them, but as they didn't land on me, I was reassured they were safe to be around. Scale is missing from my picture: the body of the larger (I presume female) insect was about an inch and a half long, about 30mm, perhaps. This is scours, probably caused by Coccidiosis. The usual symptoms are lots of irritated tail swishing, which is how the faeces get spread to both sides of the rear of the animal; and straining to defecate, often producing very little. If the infection progresses to its worst extent, there will be only blood, along with bits of gut lining. Generally the calves pick up the infection and go through a week or so of dirty bums, then they dry up again and return to normal health. Some will progress to producing blood, but still recover well. 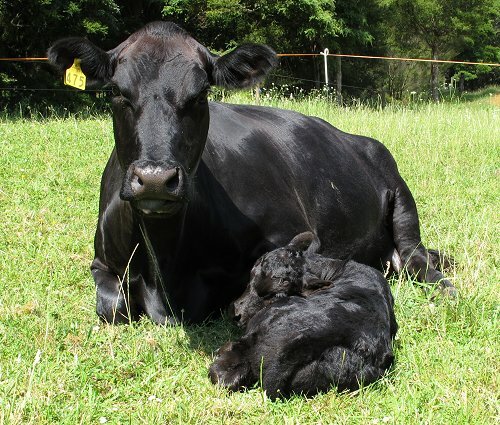 This is the very best sort of calving! I had to look twice to realise that it was 475, who'd been pregnant and quietly grazing when I last looked a couple of hours ago, who was now sitting quietly in the sunshine with this clean, dry, brand new calf. 475 produces daughters who go on the "must keep" list, but this time she's had a son. 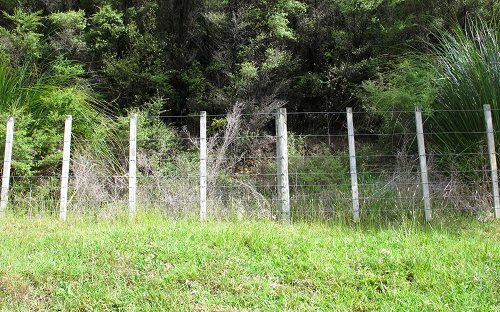 Behind this ordinary fence, which surrounds our 20-acre regenerating bush hill, I discovered a number of the Sun Orchids for which I've been hunting. One had yet-to-open flower buds, but most of the others had been eaten. I went back to check the flowering plant and on the day it would have opened, I found it too had been eaten. Rabbits, probably. Next year I'll have to get out here and do something to protect the orchids - cages over the plants, perhaps, or a great deal of rabbit shooting or poisoning. 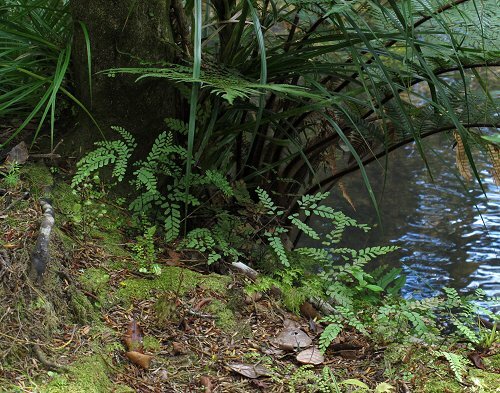 Ferns on the bank of the little stream flowing through the Bush Flat Reserve. These places are so deliciously cool in an astonishingly hot early summer. 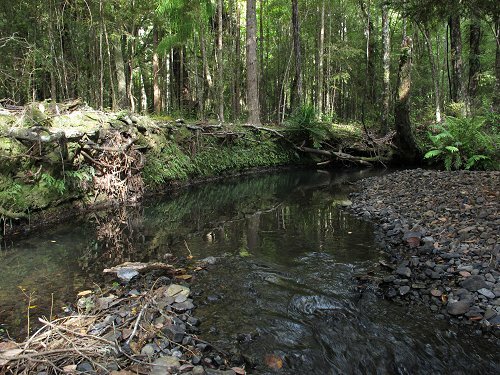 We know how lucky we are to have water like this! You may be able to see the dark line around the river bank which indicates the normal water level. I doubt this stream will ever stop flowing, but it is significantly lower than normal for this time of the year. Oh dear. 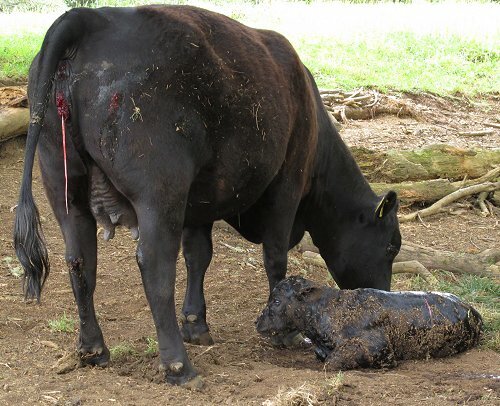 An example of advanced Coccidiosis scours: bloody faeces on the coat (causes that shiny black look), and this calf also has dried blood where it has run down between his legs! But he's lively and looks well still, so he'll probably come right in a day or two. Athena 72, daughter of Isla, with her son, sired by Te Mania Prince 153-93. 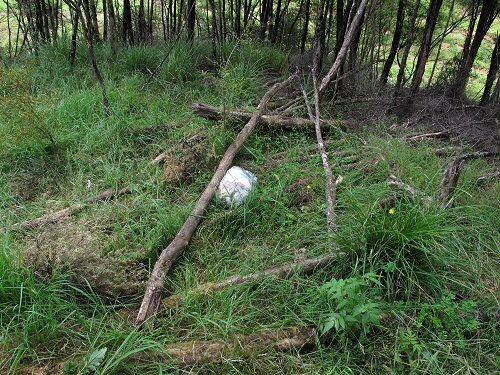 There is a picture of Isla in this paddock, only a few feet along to the right, when Athena was conceived. The longer I'm here, the more interesting this all becomes. Being able to follow families from generation to generation is really interesting to me. A tick, pulled from the udder of one of my cows, still holding onto a bit of her skin. People are fond of saying that you have to be careful pulling ticks out because they leave parts of their jaws imbedded in the skin, but it never looks that way to me. 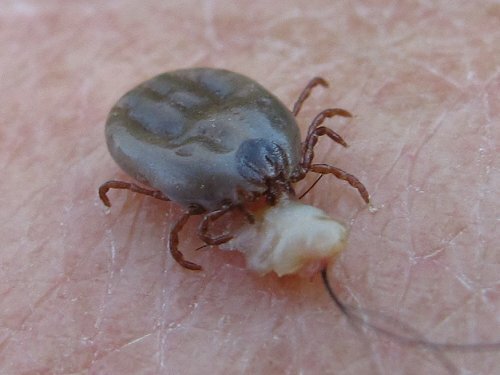 The skin which came off with the tick has, I think, been affected by whatever is in the tick's saliva, making it come away with the tick. There are more ticks on the cows than usual this year, presumably because of the early dry warm spell we're experiencing. Fortunately in this country they carry and transmit no diseases. 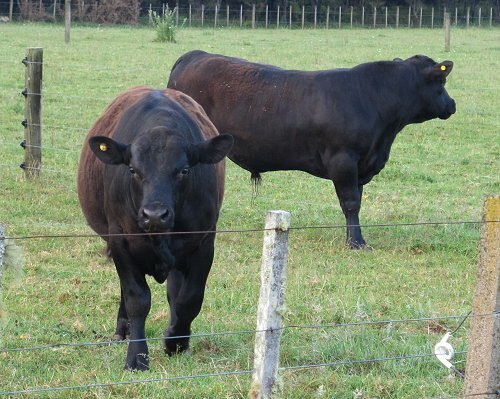 I'm not altogether sure about this bull. Any time I go past the paddock, he comes growling over to the fence. I think he's just curious and playful, rather than aggressive and territorial, which would be extremely dangerous and would prompt me to put him immediately on a truck to the works! I will, though, be very careful around him. 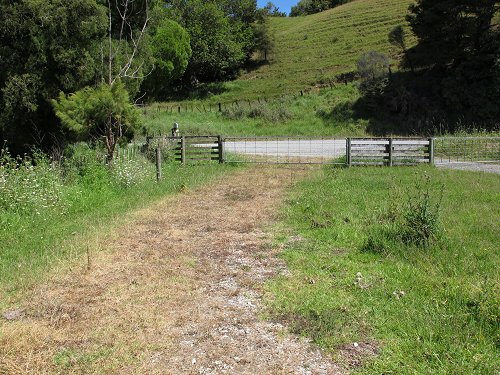 Riding my bike across the paddock on my way to check on the last cows to calve, a couple of adult Pukeko and a chick dashed across in front of me. 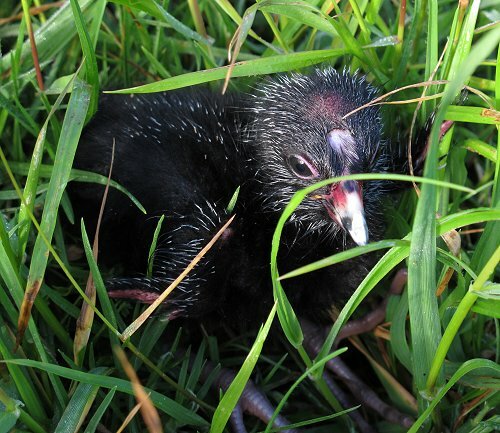 The adults launched themselves into the air and flew off into the trees along the riverbank, and the chick found the first thing which it thought would give it cover, which happened to be an alkathene water pipe lying in the grass. It responded quite aggressively to my fingers moving some of the grass aside. The amount of white on its bill indicates it's only a few days old. 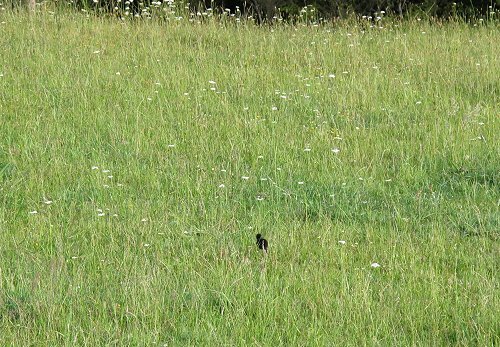 Then all of a sudden, it took to its extraordinary feet and ran after its parents, through the long grass. Heifer 604, the last heifer to calve this year, had been standing around looking pensive all morning, and took ages in labour after the two feet of her calf appeared. Eventually I went in to help her and really struggled to get the calf out in good order. He was almost stuck at his chest and gave me a horrible moment as I realised I couldn't pull him any further without the heifer also pushing, and she needed a rest! I flopped my wet hands down into the dry dusty leafy stuff on which she was lying, to stick some of it to my hands to give me some purchase on his slippery legs, then pulled for all I was worth. The calf was quite lively and alert once he'd started breathing. That is all the heifers now safely delivered, and there is only one cow left to calve. Have my cows ever been in such good condition? 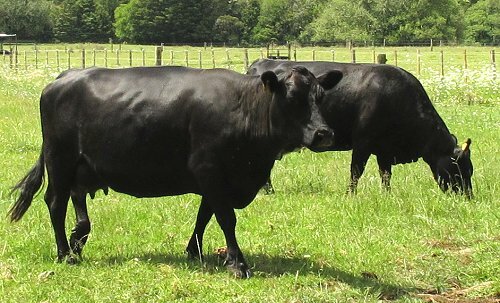 This is 475, my "monitor cow", whose condition I watch as an indicator of how well everyone is doing. Their ribs always show up in the photos, but there's a nice layer of fat over all those bones. It's ragwort time again, so I walked over about a third of the farm this afternoon. There's very little of it about: we're winning! 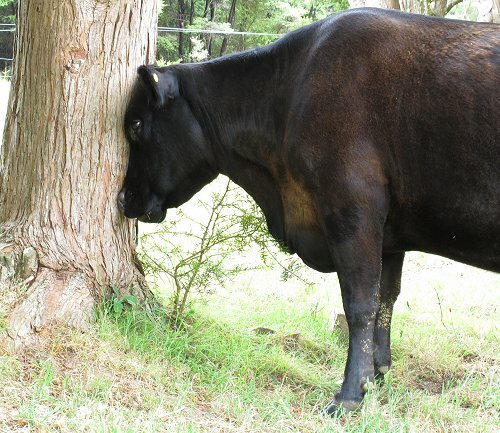 I checked the cows when I reached their paddock and was alarmed to see this cow pressing her head against a tree. There's a particular sort of brain infection which causes animals to press their heads into things - then I realised she was actually putting a lot of pressure on her nose, which must be itching madly. The ATC Cadets were camping here. At the end of their stay I understand they did an "emu parade", whereby everyone lines up and they walk across their camping area checking for and picking up rubbish. A lot of those emus were obviously blind. We like being able to share the farm with other people, and having the ATC cadets here is a nice thing for us to do, but I think this might be their last stay. Our one condition has been that they don't leave rubbish around, but this year there is even more than there was last time. I can't stop the litterers out in the rest of the world, but they're not going to come here and do it too! We set some eggs under some clucky hens 27 days ago. Two weeks ago both lots of hens deserted their nests. The weather was pretty warm, so when I thought about it, I put some of the eggs under a sitting turkey. This hen then went clucky, so I brought the eggs back to her. To my great surprise, we have a chick! I've heard their hatching can be delayed by cooling of the eggs during incubation, but hadn't known they could last this long. 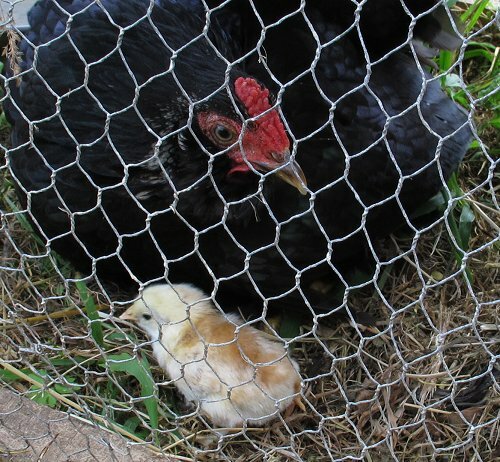 However, success was short lived and the chick was dead a couple of days later. The last calf for 2010. I wandered out for a look at the cows and found them all lying around contentedly. 542 looked entirely ordinary, except she then started having contractions, which obviously weren't her first. A membrane bag quickly appeared, so I sat on the sunny slope and watched as she delivered her heifer calf. 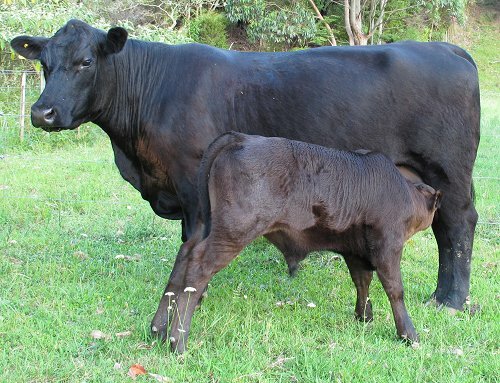 What an excellent calving season. 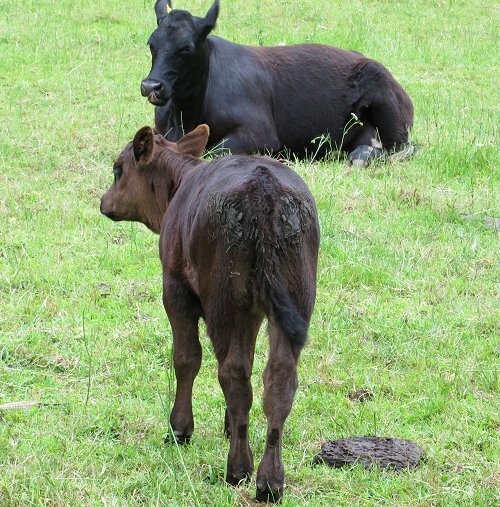 This is the first season during which we have lost no calves at all and I'm thrilled. (The only loss was the pregnancy of 572 earlier in the year.) 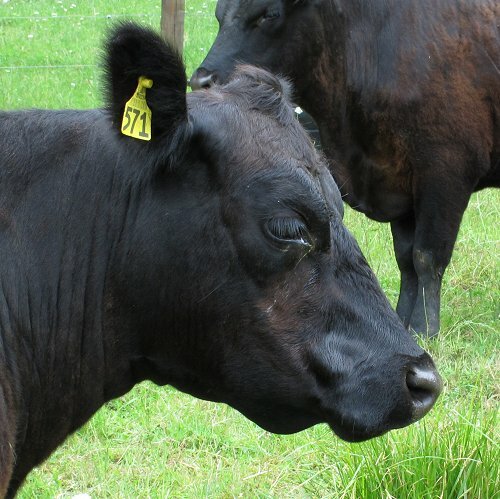 After years and years of gradually working things out, it would seem I may have eventually found the key to success: keep the stock numbers on the lighter side, keep all the cattle well fed and healthy, and things go much more smoothly all round. 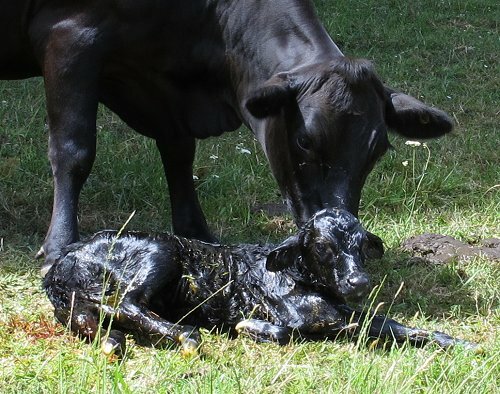 This was a very convenient day to finish calving, since Stella, my eight-year-old niece, has invited me to an end of year school event tomorrow, and I'm flying to Auckland for 24 hours. 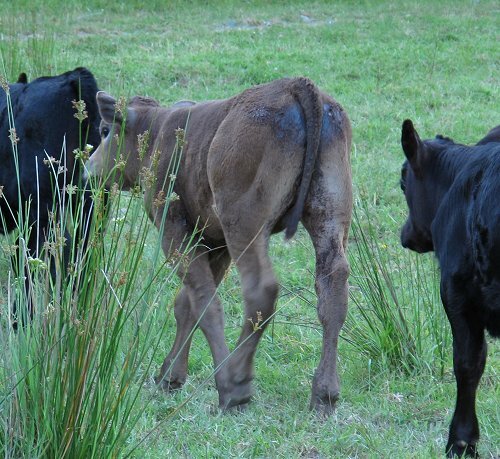 I dashed out to check on the new calf this morning and as I was walking back to the house, noticed the telltale twinkling in my vision, signalling the start of another migraine. Why today of all days? Stella's event was a "praise giving", an odd sort of thing where the children have chosen some member of their circle whom they feel has taught them something or been particularly supportive during the year. They present their chosen person with a kete (a flax kit bag) of things they've created, at a ceremony at the school. They don't get to say anything about who they've chosen or why, so it was all a bit confusing for a first-timer. Jasper chose his mother, but Stella never does. Stella told me she chose me because I've taught her to be a very good farmer. It was, apart from my headache, a very good day to have come to Auckland, because along with Stella's school event, she also had an end of year dance recital, which I was able to attend. 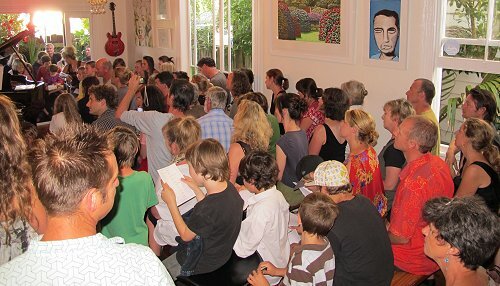 The big event of the evening was the Annual Red House Concert, Jude's recital for all of her music students, attended by around 70 people! Unfortunately all of the youngsters must have been watching too many of the "Idol" programmes on television, so instead of politely clapping at the end of each student's performance, they screamed! That's really not comfortable for a migraine sufferer. I caught a plane at 8am from Auckland and was back at home by 9.30am. Marvellous. While I was away yesterday, Stephan quietly walked two cows with very sore feet towards the yards, so they could see a vet today when I returned home. Checking or treating a cow's foot is not a particularly easy thing to do, because they are not trained, as horses are, to stand quietly while someone picks up their feet. Instead you have to use a thick, soft rope to loop around the bottom of the leg, then lift that back to tie the foot securely to a cross-bar in the race, so the cow can't kick whoever is trying to help her. The tying knots need to be of a quick-release variety, in case the cow moves the wrong way and collapses to the ground - then she'll need her tied foot freed in a hurry. The cow is often not happy about having her foot tied behind her, so there can be a lot of movement and attempted kicking of the tied foot! It's all rather fraught, and I am relieved when the process is completed without anyone getting hurt. This is Ranu 31's right rear foot, which she's been pulling up as if she has been stung, every time she puts it down on the ground. Nathan cut away some of the extra flesh and discovered what looked like evidence of a cut or puncture injury between her toes, which must have happened a little while ago. 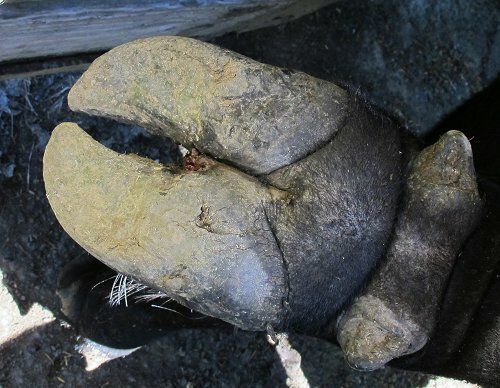 Her foot has responded by overgrowing the flesh around the injury site, and more recently the area has become infected, which with the extra inflammation has caused the pain. Irene 35's rear left foot was easier to deal with, Nathan cutting the hoof material back until there was no more black infected tissue. Both cows limped out of the yards, and we'll keep them close for a while, so they don't have to walk far. You might think we've been spraying our roundabout, but this is just the grass drying out over the metal underneath. There is still lots of grass around, but the cows and calves are approaching their biggest demand period, when the cows are milking to the best of their ability and the calves are growing fast and demanding all that milk and grass as well. We need it to keep growing! This has turned into an extended dry period and we are becoming quite nervous. It is now five weeks since we had any rain of note, and then only just over 25mm. We've had a dry spell, effectively, since the last week in September, which is very unusual. The long-term forecast is for a wet summer, but right now that doesn't feel very reassuring.